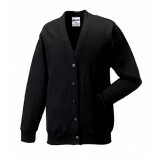 Button neck and cardigans are a great alternative to standard sweatshirts. They are a great garment that is both easy to wear and versatile with a slightly smarter look than a generic sweatshirt. Best Workwear stock a select range from Kustom Kit and Russell Workwear. Browse the garments below to find what you need, and remember the option for personalised embroidery as well!